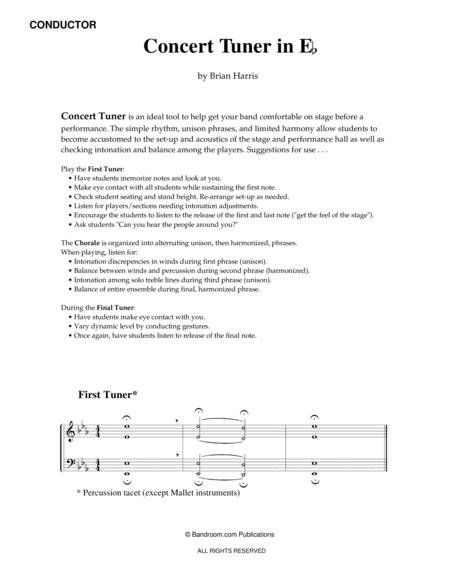 Written expressly for use on-stage before contest or a concert, CONCERT TUNER IN E-FLAT will help your band tune, adjust balance, and focus on the upcoming performance. Easier to transport than a full set of chorale books, this simple arrangement is ideal for helping players get accustomed to the feel and acoustics of the stage. Included are step-by-step suggestions of how your band can benefit from every phrase. To view sample parts, visit www.bandroom.com where you will find detailed information regarding ranges, keys, instrumentation, and more. 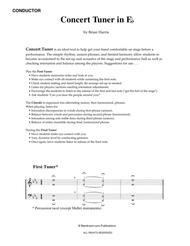 This download includes the 4 page SCORE and 22 pages of PARTS, plus a SITE-LICENSE permitting the purchasing school to print/photocopy as many copies as needed. Never lose a part again! COMPOSER: Now retired,Brian Harris holds the Ph.D. in Music Education from the Florida StateUniversity and was a band director for over 30 years at public school and college levels. Many of his works areavailable from www.bandroom.com and through Sheet Music Plus digitaldownloads.